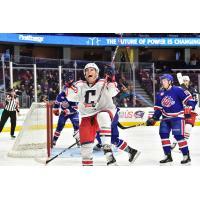 CLEVELAND - The Cleveland Monsters defeated the Rochester Americans, 5-2, on Tuesday night at The Q. With the win, the Monsters improve to 23-21-5-1 overall this season and with 52 points, sit alone in sixth place in the AHL's North Division standings. The Monsters got the scoring started in the first period when Kole Sherwood poked home a loose puck in front of the net from Sam Vigneault at 15:53 to give Cleveland a 1-0 edge. In the middle frame, Remi Elie netted an even-strength goal at 2:46 to even the score, 1-1. In the final period, Vitaly Abramov tallied an even-strength goal at 4:22, courtesy of Nikita Korostelev, to give the Monsters a 2-1 lead. Abramov picked up his second goal of the night at 11:28 thanks to assists from Ryan MacInnis and Korostelev, to give Cleveland a 3-1 advantage. The Monsters piled on moments later when Sherwood lit the lamp for his second goal of the night, this one from Adam Clendening at 13:08 to push Cleveland's lead to 4-1. The Amerks got one back at 13:59 when Wayne Simpson scored an even-strength marker to pull Rochester to a 4-2 score. Paul Bittner finished the scoring for the evening at 17:48 of the third frame, netting an empty-net goal with an assist from Dan DeSalvo to seal a Monsters 5-2 victory. Cleveland goaltender Jean-Francois Berube stopped 26 of the 28 shots he faced to improve to 15-15-4 on the season, while Rochester netminder Scott Wedgewood stopped 29 of the 33 shots he faced to drop to 17-8-2 on the year. Next up for the Monsters, it's a Friday road matchup versus the Belleville Senators with full coverage, live from CAA Arena, underway at 7:00 pm on Alt 99.1, AHLTV and the Monsters Hockey Network. Cleveland Monsters tickets for the hottest games of the year on sale now and start at only $10 per seat! Additionally, 2019-20 Monsters Hockey Club memberships, including the best seats for each game, the lowest ticket prices, exclusive year-round benefits and free gear are also on sale now. Visit www.clevelandmonsters.com/holiday or by calling the Monsters sales and service team at 216-420-0000. Be sure to follow the Monsters on Twitter @monstershockey, on Facebook at www.facebook.com/monstershockey, and on Instagram @monstershockey.